click here to donate. thank you in advance! OBIFD is a non profit organization dependent on community support to maintain our services. 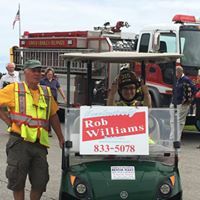 Our primary fundraising activities consist of annual appeals to island property owners and a huge yard sale and auction held each year on the second weekend in August. All donations to OBIFD are tax deductible. To donate to our annual appeals, or any time, please click on the button below. You will be taken to the secure payment site where you can make a credit card donation directly to our general fund. If you buy from Amazon using the link below, a portion of your purchases will go to OBIFD. Simple!